Cortana, Microsoft's new assistant for PCs, integrates its Bing search engine front and centre of Windows 10. This is designed to compete with Siri (from Apple), and Google Now. You can get Cortana for Windows PCs, Windows phones (Windows 10 mobile) and now for Android if you are in the USA. App security settings are shown on Google's pages. I flip from Google Now to Cortana. Although my preferred mobile device is Windows 10 Mobile my daily phone is Android due to the 'app gap' in Windows Mobile. I would like to have all my devices run with Cortana because it is genuinely cross-platform and I should be able to standardise on one personal assistant. The main issue is how "intelligent" is Cortana. Most recently I booked a flight for my holidays. 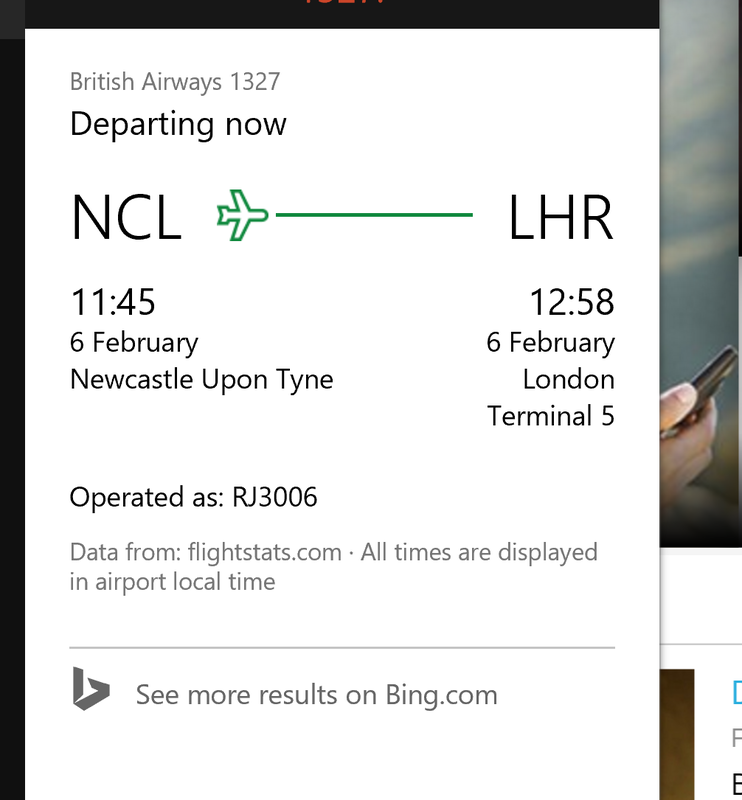 So when I receive an email from British Airways Cortana should be aware of it and notify me of the new booking and the details. It should keep track of any changes to the booking that are sent by BA etc. If I use my Google email account then Google Now is pretty good with this. The last two times it has popped up information and kept me updated. Cortana is not so good. Could it be that being from Microsoft it only like US airlines! It might be true because all the demos you see from Microsoft execs are for their flights to San Francisco from Seattle. 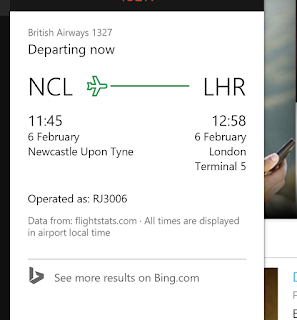 You can actually query Cortana about flights but it is blissfully unaware of email bookings. After some looking on the web it seems that Google does something special in Gmail to get Google Now to recognise flights. I suspect it's deep trawling of personal data to deliver "targetted advertisements" makes it, rather than the NSA, the best way of scanning your personal data. So Google Now has the edge. So personal information intrusion is a two way street. If we want these intelligent AI type functions in mobile devices the trade off is allowing tech companies to read your personal mail.